Helioshade Classic folding arm awning is an open folding arm awning of premium quality. 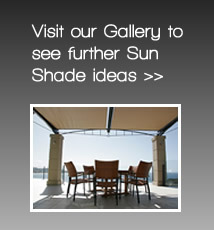 Strong and versatile, the Helioshade classic awning is simple and quick to install. 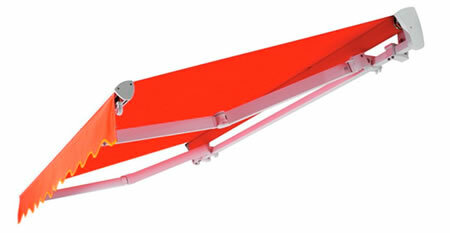 This is the strongest open style folding arm awning available on the market. The Multiflex 4 cable system in the arms is tested to give a 200 year life span with daily use! This is the only open folding arm awning with a Beaufort Category 6 wind rating. Like the fabric-cassette the classic design incorporates a 40mm square back bar which gives great versatility for fitting brackets on tricky installations. This also allows various options that can’t be incorporated into a full cassette such as oversquare where the projection is greater than the width and adjustable pitch. 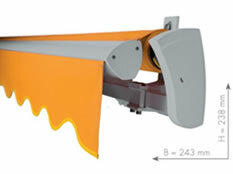 The awning can also have an optional extruded aluminium pelmet to protect the awning from weather when it is retracted. The Helioshade classic folding arm awning also has an optional drop down adjustable valance.